← Live from New York, it’s Joe Bonamassa! It’s been just over a year since the blues world bid farewell to one of its true masters in pianist Pinetop Perkins, who died at age 97 only weeks after receiving a Grammy Award for his Joined at the Hip project with former Muddy Waters bandmate Willie “Big Eyes” Smith. While that legendary collaboration will be one for which Perkins and Smith are both long-remembered, it’s good to know it wasn’t the last we’d hear from either artist, with a forthcoming CD from Smith and Roger “Hurricane” Wilson and, this week, a new album of some older music from Perkins in the form of Heaven (Blind Pig Records). 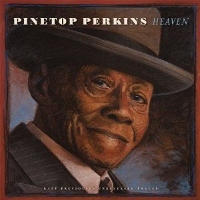 Culled from a 1986 studio performance two years prior to Perkins’ first solo album After Hours (also on Blind Pig), Heaven includes twelve previously unreleased tracks from a spry, 73-year-old Perkins, who plays solo on all but four of the songs. While Pinetop’s voice here isn’t much different from what we were accustomed to hearing in his later years, it’s damn near impossible to not be amazed by the vitality of his playing on such classics as the opening “44 Blues,” the jaunty instrumental “Relaxin’,” a boogey-woogeying “Pinetop’s Boogie Woogie,” and a superb “Sweet Home Chicago” (bearing in mind that this was recorded more than a quarter of a century ago, before the song became such a staple of blues festivals and shows). In addition to such famous Pinetop numbers as “Ida B” (which finds Perkins accompanied by a full band of guitar, harmonica, bass, and drums), “4 O’Clock in the Morning,” and the aforementioned “Pinetop’s Boogie Woogie,” the album also contains a slow and classy “Pinetop Blues,” a nifty take on the jazz standard “Willow Weep for Me,” and a closing “That’s All Right” that’s certain to reassure even the bluest of moods. And if, for some reason, that doesn’t do it for you, we suspect that “Just Keep on Drinking” will, perhaps the best example of Perkins’ energy at the time both vocally and musically. Described perfectly in the liner notes as a “bonus after-hours set of masterful music,” Pinetop’s Heaven gives us one terrific last listen to this blues legend, though there’s no doubt his music will continue to live on for some time. 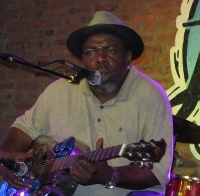 Many of the songs here are performed by Bell either entirely on his own – such as Muddy Waters’ “Why Don’t You Live So God Can Use You” and the beautiful, nearly nine-minute “meditation” of Reverend Gary Davis’ “Death Don’t Have No Mercy,” easily one of the album’s best tracks despite its simple presentation – or joined by only one or two others, among them, a funky, Joe Louis Walker-sounding “Don’t Let the Devil Ride” (which, ironically, isn’t one of the tracks to feature Walker) with only Bell on guitar and vocals and Willie Smith son Kenny “Beedy Eyes” Smith on drums; a hypnotic “Way Down in the Hole” (Tom Waits) with Smith on percussion and Cynthia Butts assisting on vocals; a “Search Me Lord” that has Bell joined just by a pair of background vocalists; and James Taylor’s “Lo and Behold,” on which Sims again lends a hand, this time on guitar and backing vocals. This, of course, works quite well interspersed with such fuller band numbers as the traditional “Trouble in My Way” – featuring guest Billy Branch on harmonica alongside drums, an upright bass, and two background vocalists – and the deep blues of the title track. 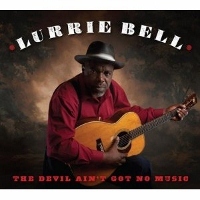 Written by producer Matthew Skoller, who also plays harmonica on the song, “The Devil Ain’t Got No Music” is the album’s sole original tune, with lyrics (“the Devil’s got the horns, the Devil’s got the tail/ the Devil’s got a smile, and the keys to the jail/ but the Devil ain’t got no music, the Devil dried up the well/ the Devil ain’t got no music, that’s why his home is Hell”) that nicely match its brooding but nonetheless alluring sound. Though vastly different in their offerings, missing out on either Perkins’ Heaven or Bell’s The Devil Ain’t Got No Music – each heavenly in its own right – would be both a shame and a sin. This entry was posted in Albums and tagged Billy Branch, Joe Louis Walker, Kenny Beedy Eyes Smith, Lurrie Bell, Matthew Skoller, Otis Clay, Pinetop Perkins, Roger Hurricane Wilson, Willie Big Eyes Smith. Bookmark the permalink.